With US equities closing moderately lower, the VIX settled higher for a second day, + 11.6% @ 15.38 (intra high 15.57). Near term outlook is very mixed, with equity moderate chop into the Wednesday FOMC announcement, before resuming lower. 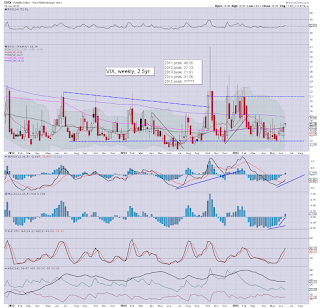 The VIX 20 threshold looks out of range in the current cycle. *note the bollinger bands on the weekly cycle... they are getting tight (like Sept' 2014), a break into the 20s looks due this summer.. but not in the current up wave. Despite the ongoing Greek situation, the market has very little concern... which is pretty incredible. 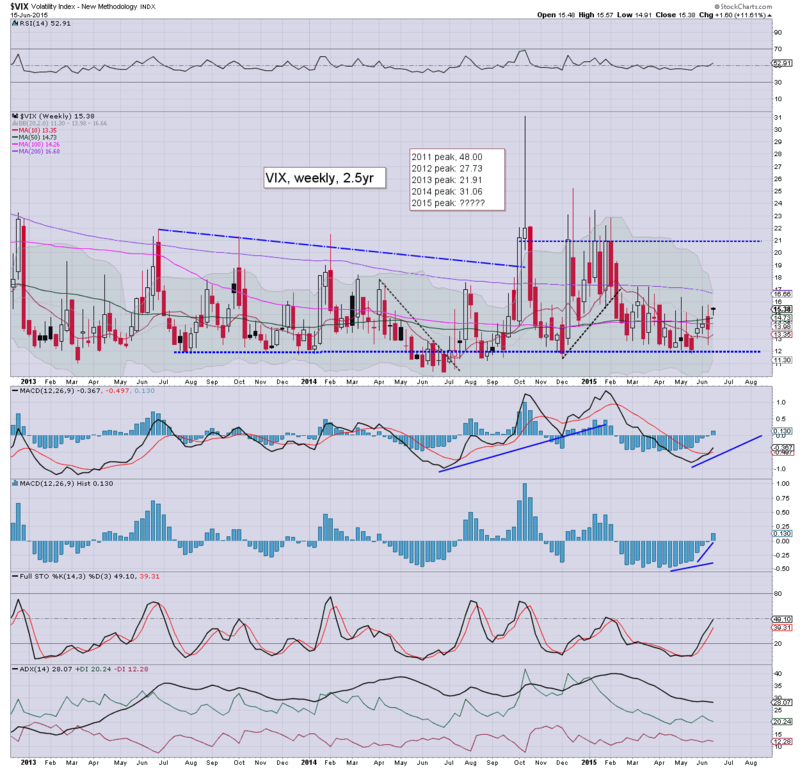 The bigger VIX weekly cycle looks to have floored (in momentum terms) in mid April. The next multi-week cycle peak looks to be in Sept/Oct. US equities closed moderately lower, sp -9pts @ 2084 (intra low 2072). 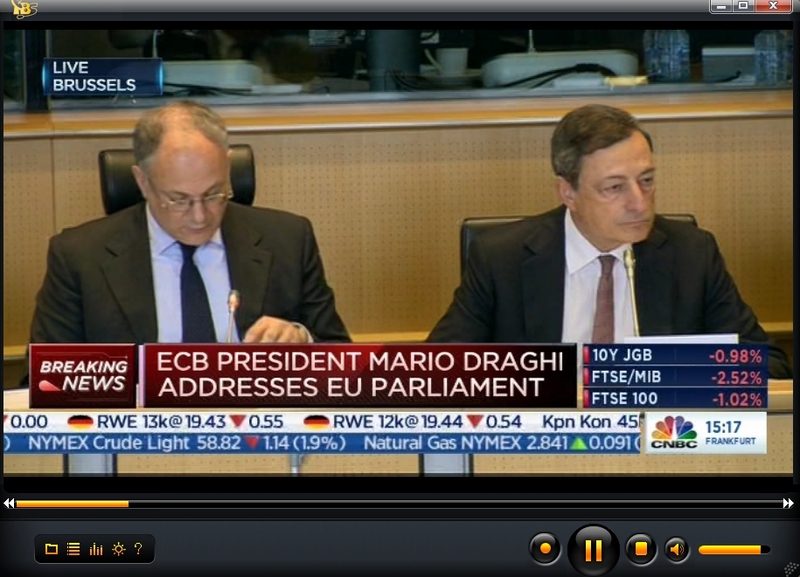 The two leaders - Trans/R2K, settled lower by -0.5% and -0.3% respectively. Near term outlook is very mixed, with viable moderate upside/chop into the FOMC announcement (Wed' 2pm). An eventual test of the 200dma in the sp'2055/50 zone looks probable. *closing hour was continued minor chop, and indeed, market was broadly stuck from 11am onward. So, the second consecutive net daily decline, but still... nothing for the equity bears to get overly excited about. I would guess we'll see increasing chop tomorrow.. and into Wednesday afternoon. From there... perhaps a brief spike.. but then a reversal. US equities remain moderately lower, ahead of the two day FOMC meeting. 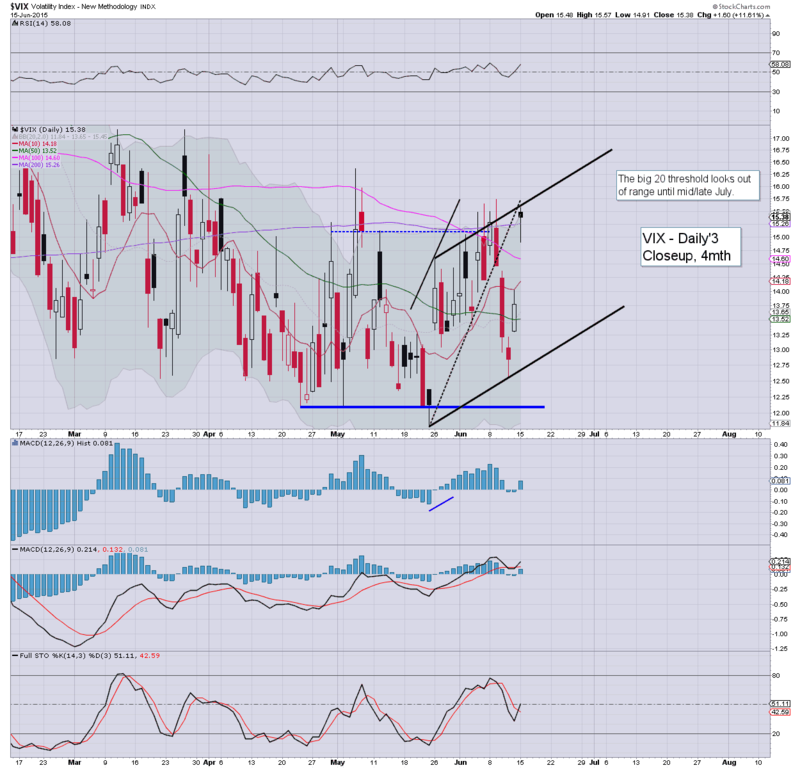 VIX remains relatively subdued in the mid teens.. with the big 20 threshold still out of range in the current cycle. USD has turned negative, -0.2% in the DXY 94.80s.. which is pretty incredible considering the Greek situation. Price action remains leaning on the bearish side.... but still.. the downside is simply not being sustained. Same old nonsense. Again, it remains incredible to consider that the Eurozone is in imminent danger of seeing one of its member states exit.. and the VIX is barely able to hold the mid teens. 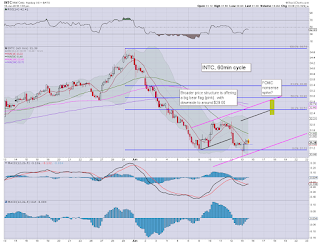 *I have my eyes on INTC as a short... but not until Wed'.. probably after the 2pm announcement. US equities remain weak (if moderately), and now its a case of whether there will be enough 'spooky news' to break the double floor of sp'2072. For once, VIX is at least holding up, +11% @ 15.30s... a daily close in the 16s would be interesting.. ahead of the Wed' FOMC. Its getting somewhat tiresome. Again, its a case where we are somewhat lower, but in the bigger picture.. we're still within the same range. 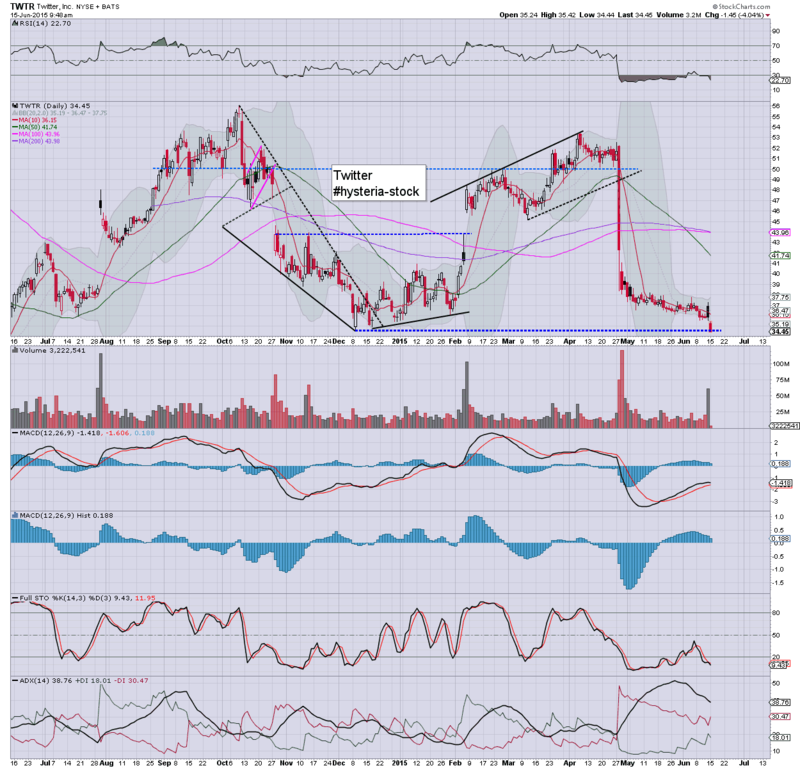 *I've eyes on INTC.. as a viable individual company short... but frankly... I ain't interested at this time or price.. perhaps late Wed'... after the Yellen is out of the way. ... as ever.. its just an idea. Broader price structure on the daily/weekly cycles is a very bearish H/S.. offering the $26/25s later this summer. Despite an equity bounce from sp'2072 to 2086, the VIX is holding up rather noticeably, +10% @ 15.10s. The 16s will be quickly hit on any break <2072. USD is back to flat... which is somewhat bizarre, considering the ongoing Greek situation.. mid term target remains DXY 92/90.. before a hyper ramp. re: the USD. Remains on track.... from a pure chart perspective..its suggestive of continued weakness into end month/early July. Little to add on equities. Bears can't really get excited until we're sustainably trading in the sp'2040s.. and even then... the giant 2K threshold will be offering mighty strong support. notable weakness: TWTR -2.7% in the $34s.... no profits.... and not even the momo chasers seem interested. 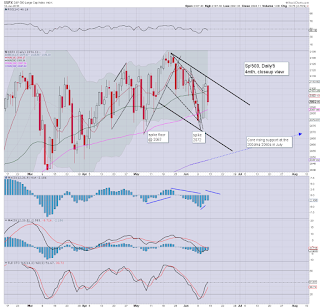 US equities are in moderate chop mode, having bounced from sp'2072 to 2086. The double floor of 2072 is vulnerable to failing, with the VIX not cooling much, +9% in the low 15s. USD is +0.1%, as the Euro is under some natural downward pressure. Gold is battling to build gains, +$8. 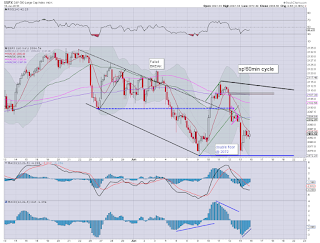 Renewed equity weakness in the latter part of the day remains probable. The bigger weekly VIX cycle is offering 16/17s in the immediate term. 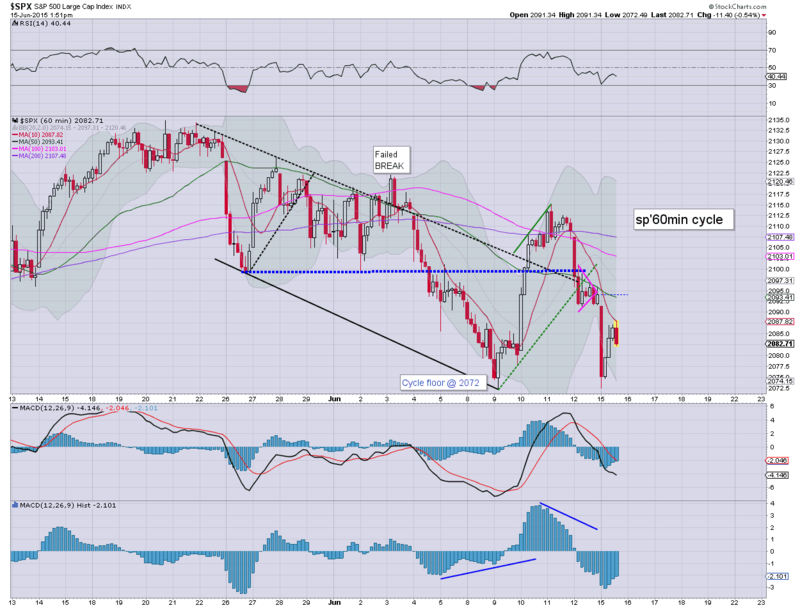 The 20 threshold still looks out of range this month. 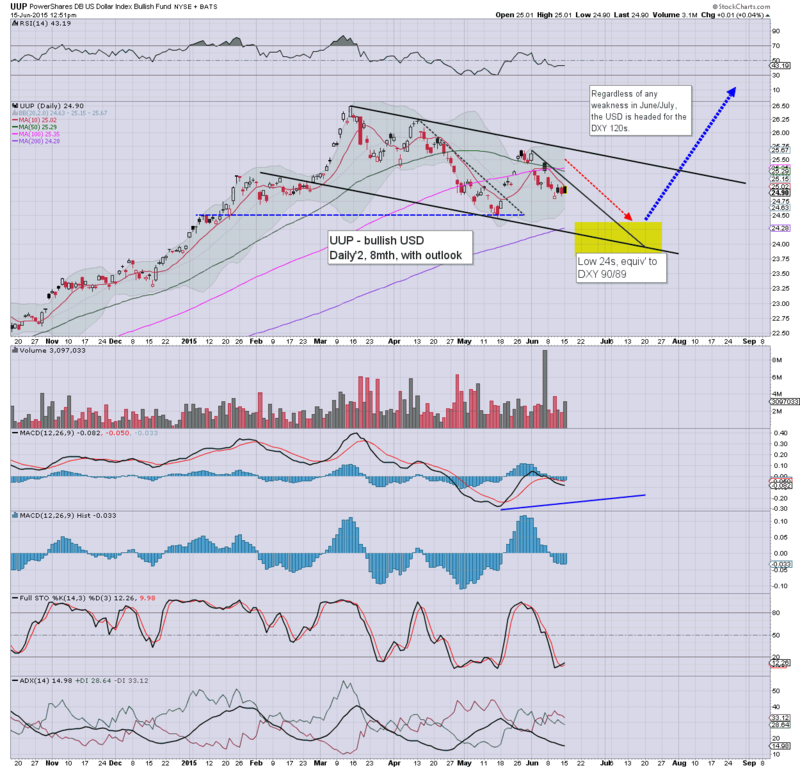 notable weakness: coal miners, BTU -4.0%.. now in the $2.40s... the sector of horror. 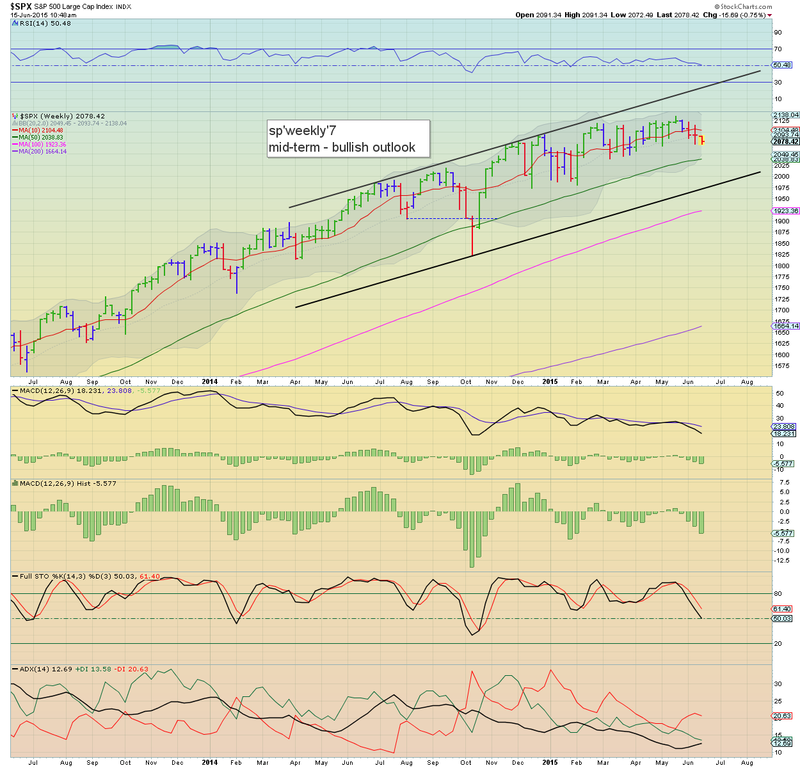 US equities are seeing a touch of minor chop in the sp'2070s, but the far more interesting issues are in regards to the bigger weekly/monthly cycles. There are multiple aspects of support in the 2055/45 zone, only with a weekly/monthly close under there, can any equity weakness be taken seriously. 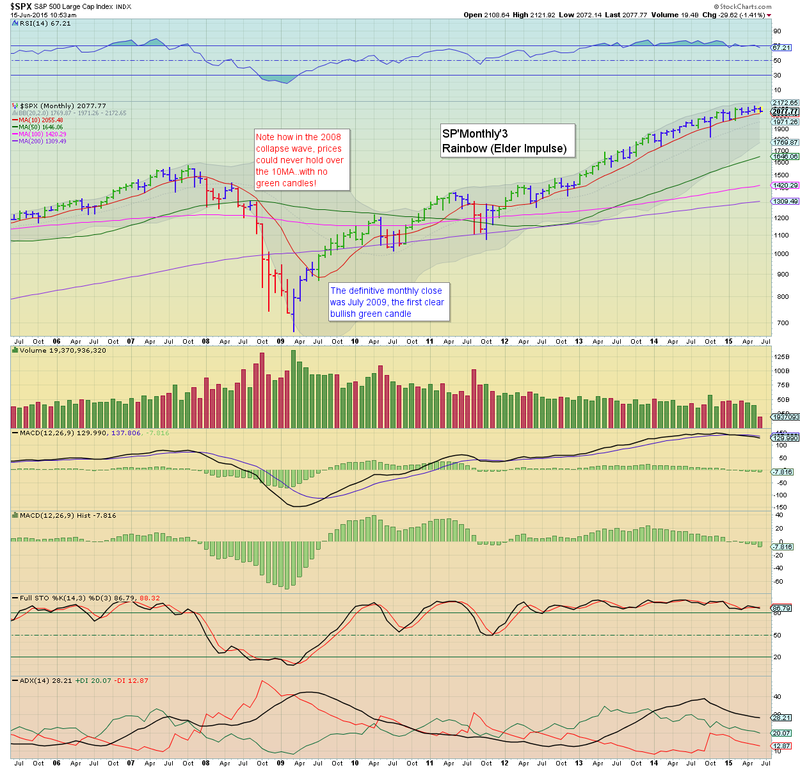 *note the monthly 10MA @ 2055. That is something to really keep in mind for the rest of this month. 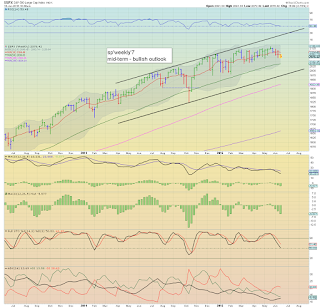 A monthly close in the 2040s would be pretty decisive. Regardless of today's close, what really matters is whether we see sustained action under sp'2050. Clearly, a sig' correction is due... even the mainstream are starting to accept that, but was 2134 the top of this recent multi-week up cycle? 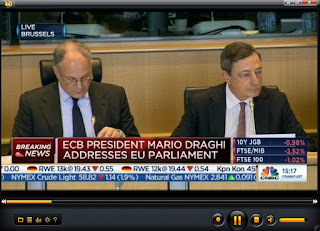 Frankly, I'm still highly suspicious of post FOMC upside.. and the whole 'Greek situation' remains a treacherous one. Why would they not want to kick the can another few months. How long does it take to print a few hundred billion Drachma? Without question, with things getting increasingly shaky, those not trading with stops across the next few months, are going to have some seriously bad days. There is no excuse for it. 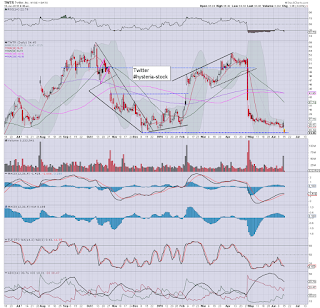 notable weakness: TWTR, -4.1% in the $34s.... nothing good there... but then... its a loss making company. 11.39am.. Despite a rally from 2072 to 2082... VIX is holding up very well. US equities open with borderline significant declines, the recent low of sp'2072 looks highly vulnerable. 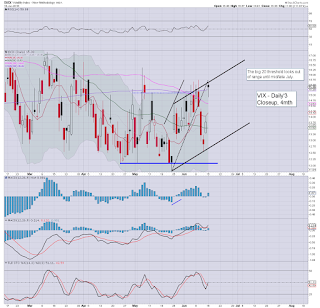 VIX is reflecting some market concern about the 'Greek situation', +12% in the mid 15s. USD is +0.2% in the 95.10s as the Euro is under natural pressure. Oil is notably weak, -1.2%. A busy week is underway! Who wants to buy this mornings dip? 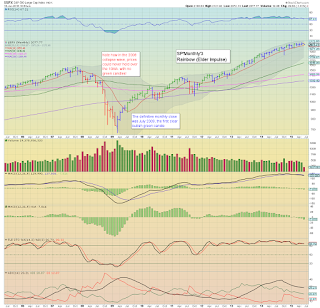 Even more critical.... first support on the giant monthly cycle.. .10MA @ 2055. Any sustained break of that.. would be a real problem. 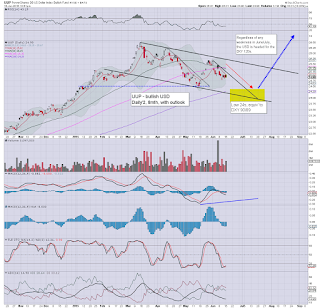 So..eyes on the 2055/45 zone this week... unless that is sustainably broken under... its just the same old market tease. notable weakness: TWTR, -4.0% in the $34s.. the lowest level since 2013. Until TWTR starts charging people for 'verified accounts'... or something to raise at least some degree of regular income, I can't take it seriously. Good morning. Futures are moderately lower, sp -11pts, we're set to open at 2083. 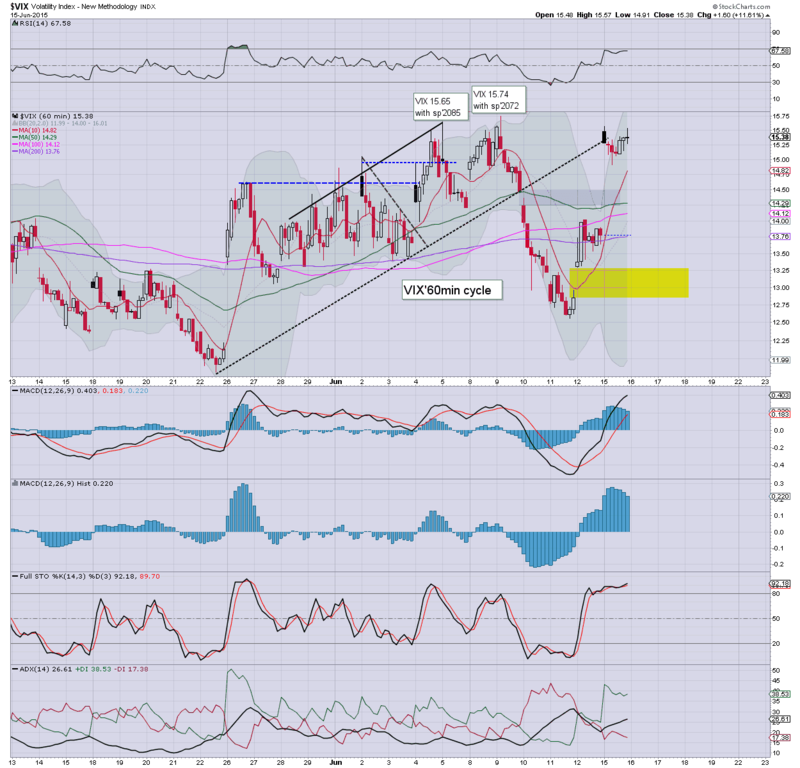 USD is on the rise, +0.3% @ DXY 95.30s. Metals are seeing some minor chop, Gold +$1. There is notable weakness in WTIC Oil, -1.4% in the $59s. *awaiting a trio of econ-data this morning. So.... here we go again. Opening weakness to start the week as markets are a little concerned about Greece. Or maybe its just pre-FOMC weakness? Regardless of the 'excuse', things don't get interesting unless we can break <2072... and that is a full 22pts (1.1%) lower. Considering recent price action.. it won't be easy to break under there. 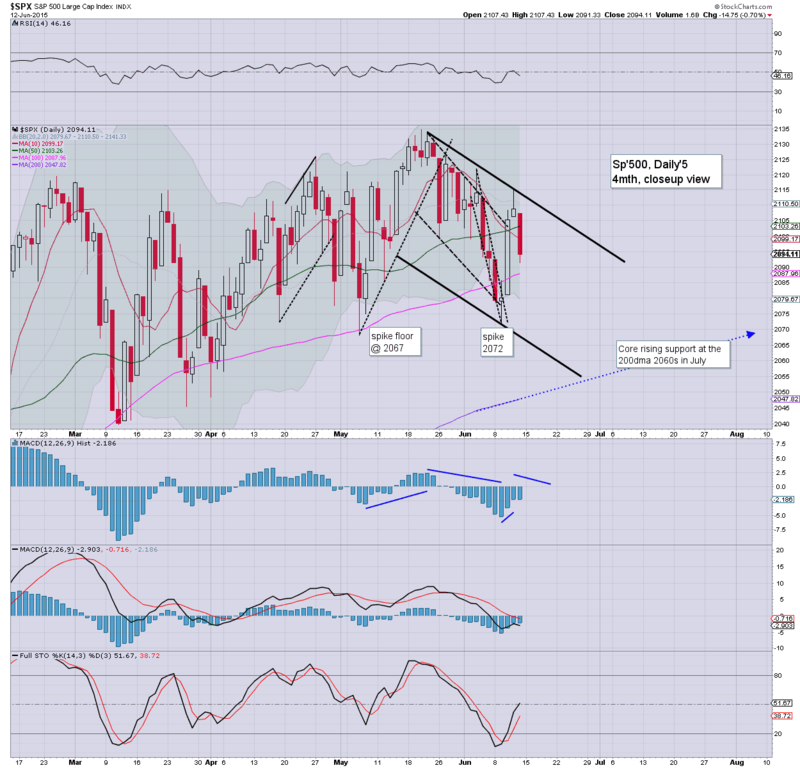 A test of the 200dma (2050s) would be somewhat natural, considering the recent months of tedious price chop. If correct, that might equate to VIX 17/18s. As ever... for me, I will have particular eyes on the USD... which still looks set for weakness into end month/early July...to DXY 92/90 zone. **NSFW... (but hey.. who can be polite after last night? Hopefully, the equity bears won't have to do the walk of shame after the FOMC this week. 9.11am... A great start to the week for TWTR, -1.8% in the $35s... doesn't seem much hope for that until earnings.. or rather.. lack of... in July. 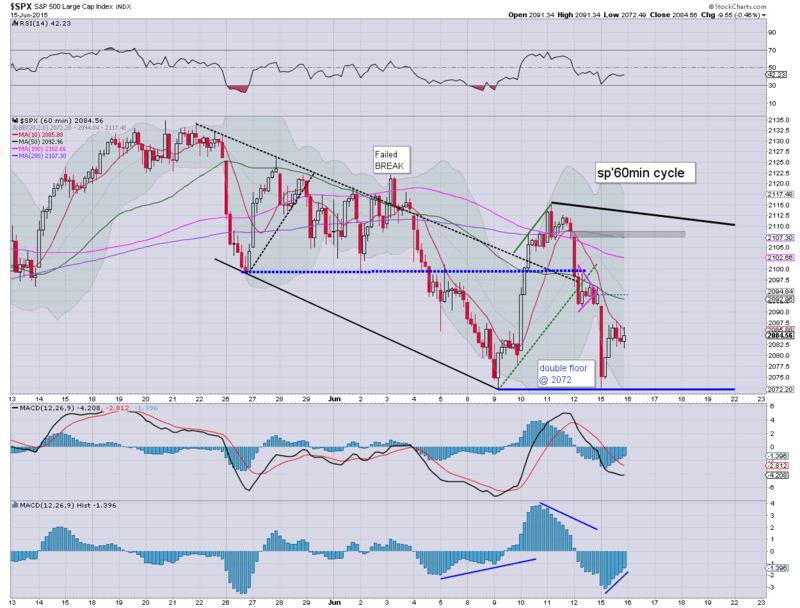 sp' set to open -14pts.... @ 2080... 8pts shy of breaking a new cycle low. 9.33am.. .. market starting to get rattled.... eyes on the VIX +12% in the 15.40s. 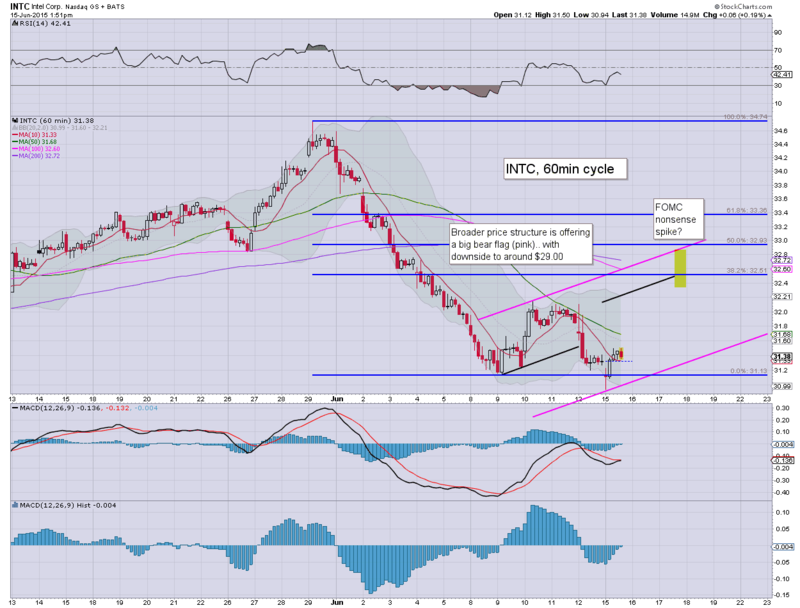 Weekly cycle offering 16/17s. 9.39am.. 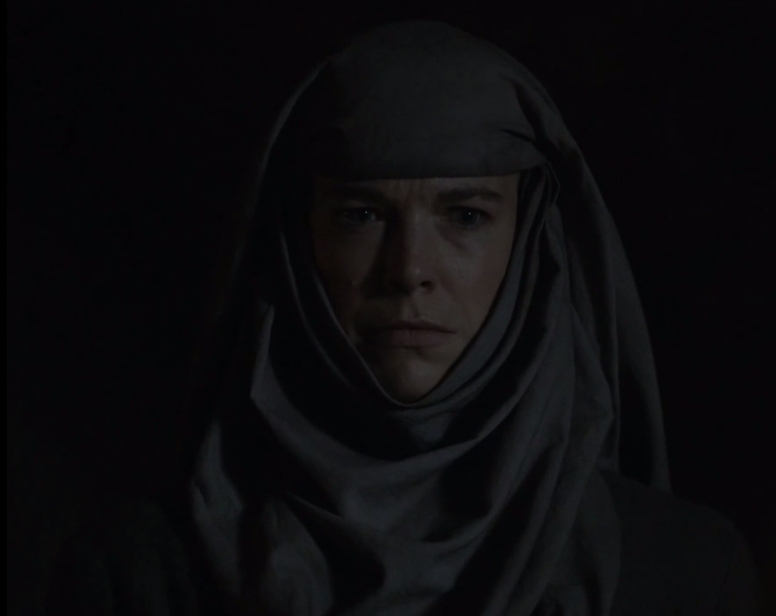 Opening VIX candle has turned black.. Hmmmmm... long day ahead though.